The President of India, Shri Pranab Mukherjee has expressed heartfelt condolences over the sad demise of former President of India, Dr. APJ Abdul Kalam. “The passing away of former President of India, Bharat Ratna Dr. APJ Abdul Kalam is a deep personal loss for me. I will always cherish my long association with him. 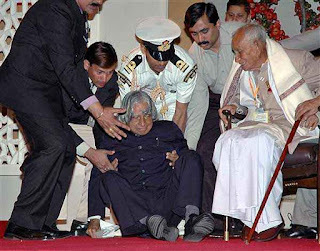 As President of India, Dr. Kalam was immensely popular and greatly admired. His warmth, humility and simple ways endeared him to one and all. He had a special love for children and sought to constantly inspire the youth of our country through motivational speeches and personal interaction. Dr. Kalam will be long remembered for his passion for science and innovation and his contributions as an eminent scientist, administrator, educationist and writer. Dr. Kalam’s achievements as leader of India’s defence research establishment vastly enhanced the safety and security of our nation. For his tireless services to the nation, he was honored with numerous prestigious awards. The President of India, Shri Pranab Mukherjee has decided to call off all his programmes in Karnataka and return to Delhi today (July 28, 2015) morning in view of the sad demise of former President Dr. APJ Abdul Kalam.